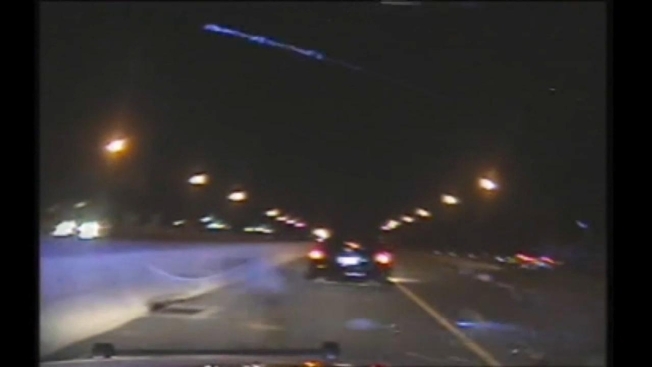 Loudoun County Sheriff's Office released dash cam video to News4's Northern Virginia Bureau, showing a DUI suspect crashing his vehicle into two deputies' cruisers. It happened around 1 a.m. Sunday on Route 28 near Church Road in Sterling, Va.
Deputies charged 26-year-old Eric Stiber of Ashburn with DUI. Neither Stiber, nor the two deputies, was injured. "They were able to see what was happening, just before it happened and were able to get out of the way, and so thank God they we're able to do that because that was a very, very dangerous situation," said Loudoun County Sheriff Mike Chapman. Chapman said nationally, about a dozen officers die each year getting hit on the side of the road. "A lot of people don't understand how dangerous it is to just be an officer and do a traffic stop on somebody," Sheriff Chapman said.